Pumpkin Pecan Granola loaded with dried cranberries, pecans and pumpkin seeds. Perfect for breakfast or as a snack. So much better than store-bought! Thank you Calorie Control Council for sponsoring this post. The opinions and text are all mine. You guys know how much I love granola. So far i’ve shared my Maple Pecan, Peanut Butter Chocolate Chip, Coconut and Nutella Skillet Granola. Now we can add this Pumpkin Pecan Granola to the list! I always have granola on hand because it makes a super healthy snack or breakfast. Granola provides fiber and nutrients like iron and potassium. For extra fiber I added nuts, pumpkin seeds and flax seeds. This granola is loaded with tons of pumpkin flavor. It smells wonderful when it is baking in the oven. Perfect for Fall! I am so excited to partner with the Calorie Control Counsel to share some facts and benefits of fiber. Although experts suggest that adults should consume 25 to 38 grams of fiber per day, the average adult only consumes 15 grams per day. We need to change that! Dietary fibers are found in lots of the foods you consume everyday – fortified yogurt, ice cream, and cereal can be good sources of fibers. Helps with your gastrointestinal health. Some dietary fibers help fuel your colon cells, leading to anti-cancer and anti-inflammatory benefits. Some dietary fibers do not just lower cholesterol, but they can also help to control your blood pressure. Serve the granola with milk or on top of greek yogurt. The granola can be stored in an airtight container for up to a week at room temperature or in the freezer for up to 2 months. Add all of the ingredients to a medium bowl. Toss to combine. Make sure all of the oats are coated. 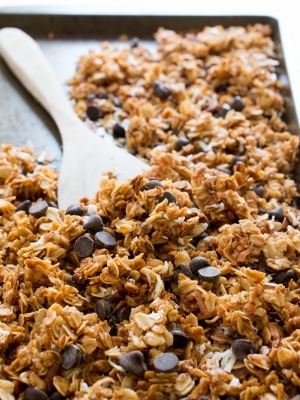 Spread granola evenly on a baking sheet lined with a silicon baking mat. Bake for 15 minutes and stir the granola carefully not to break up clusters. Bake for an additional 15 minutes or until golden brown. Allow the granola to cool. The granola with get crunchier as it cools it tends to be sort of soft when it first comes out of the oven. 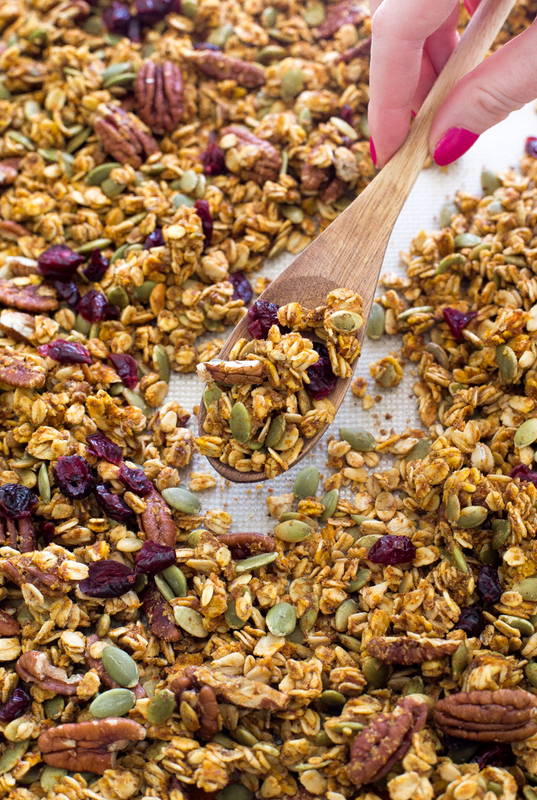 Toss cooled granola with dried cranberries and enjoy. Store in an airtight container at room temperature for up to a week or freeze for up to 2 months. Pumpkin granola is a favorite of mine in the fall! I love the addition of pecans in here, Kelly! I think I could munch on this all day long! this sounds so delicious, seriously homemade granola is always so much better than the store bought stuff! Pumpkin granola? Yes please! I am obsessed with pecans too – I just can’t get enough of them. 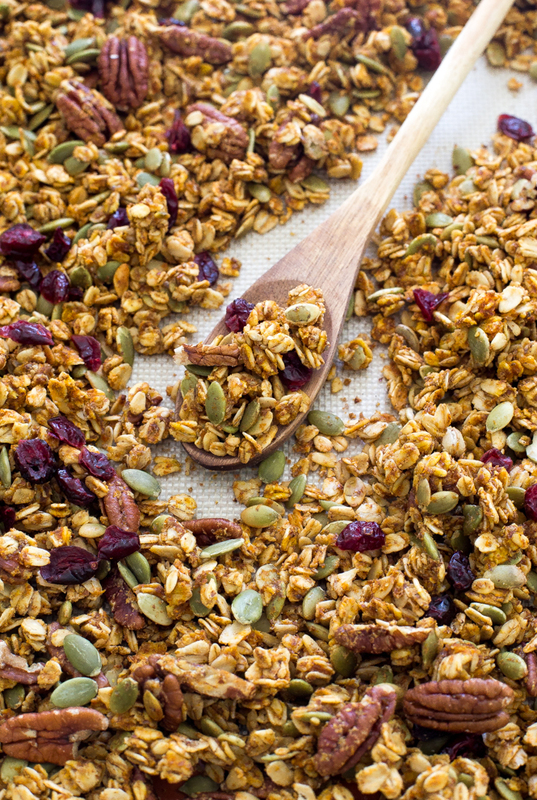 Granola is such a great go to snack, and I am LOVING your fall spin on it! 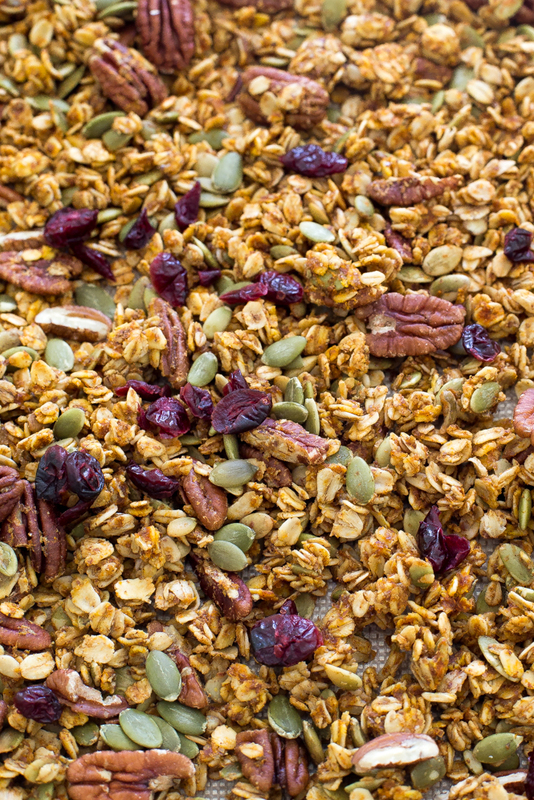 Granola packed with dried cranberries, pecans AND pumpkin seeds sounds like a total winner! Pinned! Cheers, girlie! 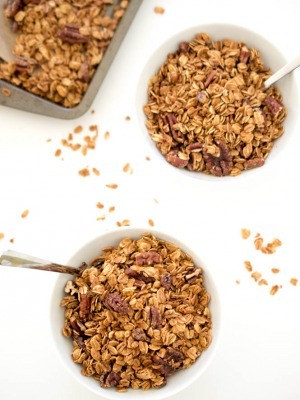 I’m always looking for ways to get more fiber in my diet, and this granola looks like a super delicious, wonderful way to do it! 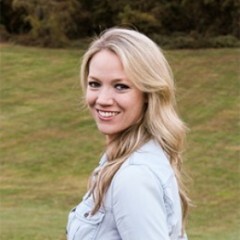 I am loving this fall granola Kelley! Perfect with a cozy blanket and a cup of coffee!